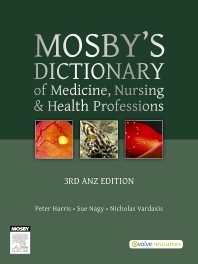 Widely used by students, educators and professionals, Mosby’s Dictionary of Medicine, Nursing & Health Professions, 3rd ANZ Edition is the definitive reference text for Australian and New Zealand regions. Harris, Nagy and Vardaxis’ Mosby’s Dictionary, 3rd Edition delivers more than 1,100 new and revised definitions, more than 50 new drug entries, and a total of 74 new and updated tables for key reference information to complement definitions. As the only Australian medical dictionary, you also benefit from context-specific information written in local spelling conventions alongside phonetic pronunciation guides throughout Harris, Nagy and Vardaxis’ reference book. Enhance your knowledge base with an array of free online content, which supplements Mosby’s Dictionary of Medicine, Nursing & Health Professions, 3rd Edition. Make the most of the online regionalised spellchecker, five comprehensive appendices and an extensive image collection that can be viewed offline, including a printable colour atlas of human anatomy.